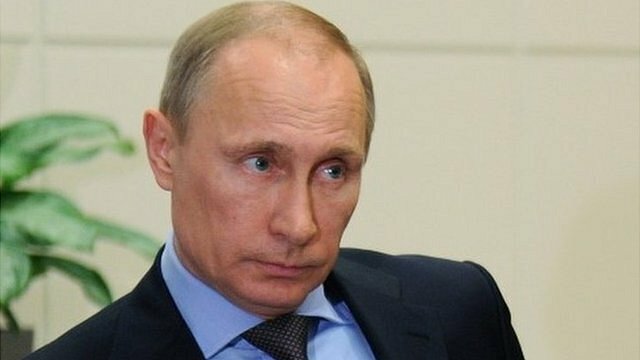 President Vladimir Putin has formally informed the Russian parliament of Crimea’s request to join the Russian Federation. This is the first legislative step towards absorbing the peninsula. Vladimir Putin, who signed a decree on Monday recognizing Crimea’s independence, also approved a draft bill on the accession. The move comes after a referendum on Sunday in which Crimean officials say 97% of voters backed splitting from Ukraine. The EU and the US have declared the vote illegal and imposed sanctions. Kiev has appealed to the international community not to recognise the result of the vote, which interim PM Arseniy Yatsenyuk described as a “circus” carried out at gunpoint. On Tuesday, Arseniy Yatsenyuk said that “for the sake of preserving Ukraine’s unity and sovereignty”, Kiev was prepared to grant “the broadest range of powers” to Ukraine’s other mainly Russian-speaking regions in the south and east, which have seen pro-Moscow protests in recent weeks. In a pre-recorded address on Ukraine’s 5 Kanal TV – delivered in Russian – Arseniy Yatsenyuk said the reforms would give cities the right to run their own police forces and make decisions about education and culture. Crimea was taken over by pro-Russian forces in late February after Ukraine’s pro-Moscow President Viktor Yanukovych fled to Russia following months of protests. However, Russia has always insisted the troops are not under its direct control. Kiev is also concerned about a build-up of Russian troops on its eastern borders, and has authorized the partial mobilization of 40,000 troops. President Vladimir Putin is due to address both houses of the Russian parliament in a special session at 15:00 local time. A delegation of Crimea’s new leaders is also expected to attend. Russian news website Gazeta.ru, quoting sources, says that after the speech, President Vladimir Putin and the speaker of the Crimean parliament, Vladimir Konstantinov, are expected to sign an agreement on Crimea’s “entry into the Russian Federation”. Having approved the draft bill, Vladimir Putin has told lawmakers “to consider it practical to sign the agreement at the highest level,” Russia’s Interfax news agency reports. Once signed, the bill must be approved by the constitutional court and then ratified by parliament. The process is likely to be completed this week, after which Crimea is expected to be considered a new part of the Russian Federation, with the status of a republic. In a sign of the wider impact of the Crimean referendum, parliament in the breakaway Moldovan region of Trans-Dniester announced on Tuesday that it too had appealed to Moscow for the right to join Russia, reports said. Crimea was transferred from Russia to Ukraine while under Soviet rule in 1954 and much of its population is ethnic Russian.